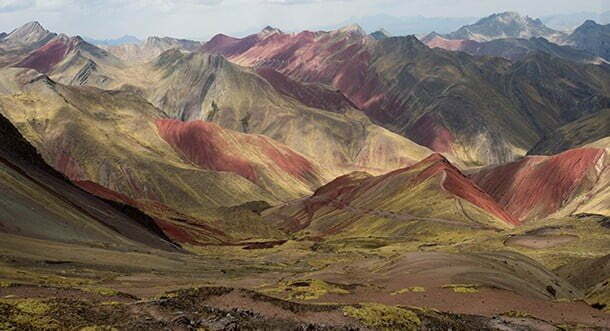 Explore the less-crowded rainbow mountain, a UNESCO World Heritage Inca bridge, and impressive, ancient ruins! Discover new sights of Cusco region and challenge yourself! Are you into trekking? 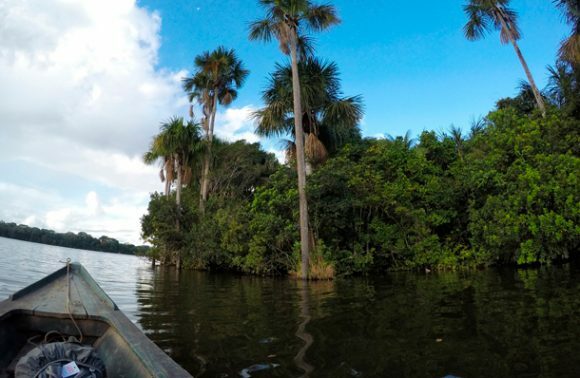 Discovering natural wonders and ancient ruins high up in the Andes? Are you looking for lesser known trails, away from the typical Cusco crowd? This tour has all that and much more! Spend two full days, visiting both, the rainbow mountains of Palcoyo and the Waqrapukara sanctuary in the Apurimac Canyon! But it is not all. In this tour, you will also be hiking to the last Inca bridge Q’eswachaka. During this excursion, you will find yourself trekking to three of the most breath-taking locations of the Cusco Region. 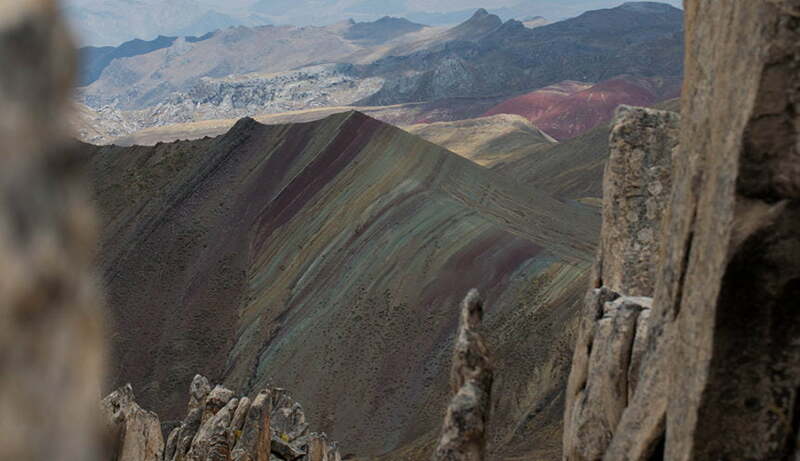 Palcoyo is located in the high Andes, where the natural minerals of the soil, give the hills multiple colours. Get immersed in this otherworldly scenery: hiking around the area, conversing with the locals, and capturing beautiful photographs. The Waqrapukara ruins are a mysterious complex perched on top of a natural structure. Definitely Pre-Incas, historians speculate that the ruins could potentially have been a sanctuary or an astrological observatory. Make the journey into the Apurimac Canyon and find out for yourself! You will be surrounded by the Andean nature, watching herds of horses running freely in the valley and the rare Vicunas, striding along the canyon’s slopes. Waqrapukara is perched on the edge of the deepest part of the canyon and offers a rewarding view from the top. 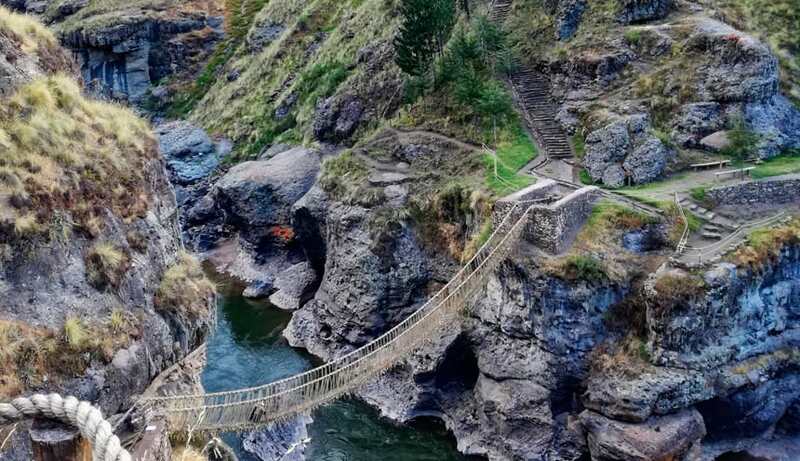 The Q’eswachaka Inca Bridge is a UNESCO World Heritage site. Here is an exciting scenery, a beautifully constructed bridge, testament to age-old engineering and ancient traditions. 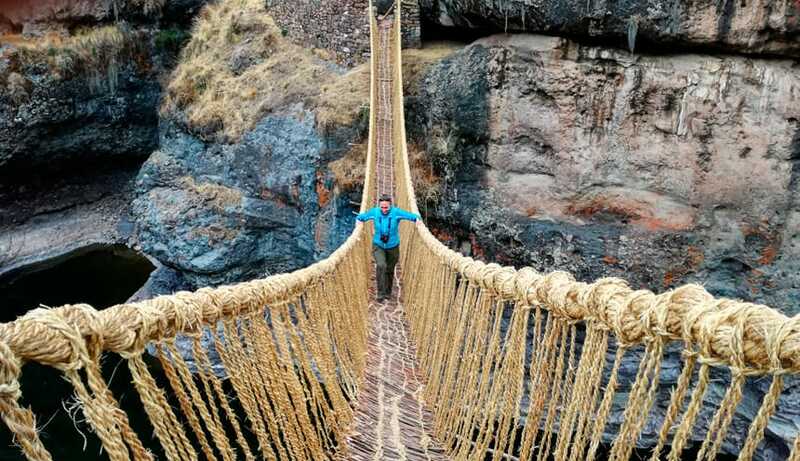 The bridge is made from ropes and is carefully crafted and reconstructed every year by the Quechua people. Do not only look! Go for a thrilling walk across the bridge and experience it first-hand! We start our journey, early in the morning, by getting a bus to Palcoyo. As we climb from 4,820 meters to 4,960 meters, we will notice the landscape changing and the colourful minerals on the ground, being more and more present among the mountains and valleys. We will hike around Palcoyo for aprox 2 – 2.5 hours, embracing the beauty of nature and capturing fascinating photographs. After lunch, we will drive for about 1 and a half hour to the Q’eswachaca Inca Bridge. Keeping ancient traditions alive over centuries is not a small achievement, but it is managed perfectly by local Quechua communities, here, in the Cusco region. 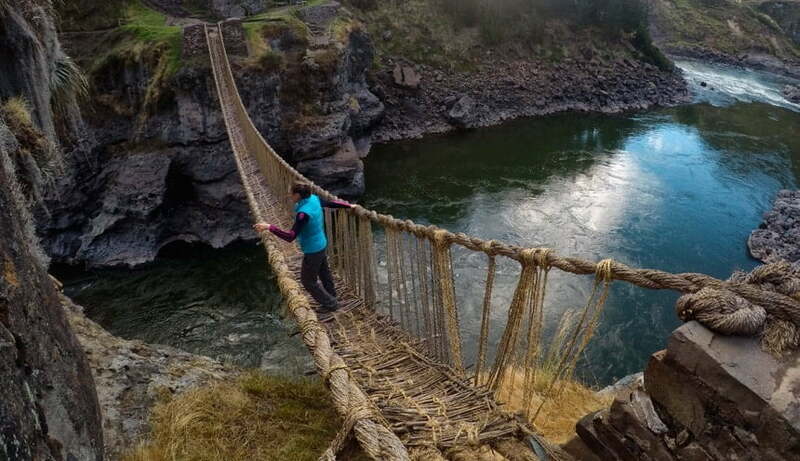 Four Quechua communities unite themselves every year in order to rebuild the bridge completely from scratch. The secrets of its structure and construction process are handed down from generation to generation. Their aim is to maintain exactly the same style and materials that were used more than 500 years ago by Inca engineers. 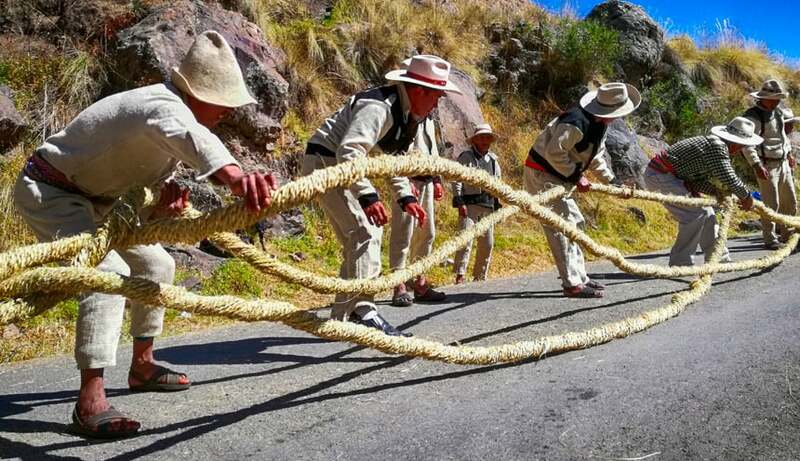 Thanks to this tradition and the strong will of the 1,000 people who participate in the bridge´s annual reconstruction, we can step away from history books and enjoy an interactive experience of the Inca culture. Come and experience Inca engineering work in the 21st century and take a walk across the Queswachaka (Q’eswachaca) Bridge! Optional: For those of you who want to make a short downhill trek, approx. 30 minutes, on a ancient Inca trail, we can take a trail from one part of Qhapaq Ñan to the Queswachaka (Q’eswachaca) Bridge. At around 5:30 pm we will leave the Q’eswachaka Bridge and drive for about 1,5 hours to Chuquicahuana, where we will be staying for the night in a local hostel. Following breakfast, at around 6:30 am, we will drive for approx. 1,5 hour to our trek starting point near Pitumarca village. Once arrived there, we will start trekking to Waqrapukara. It will take about 3 hours, winding down the hills, deeper and deeper into the canyon. 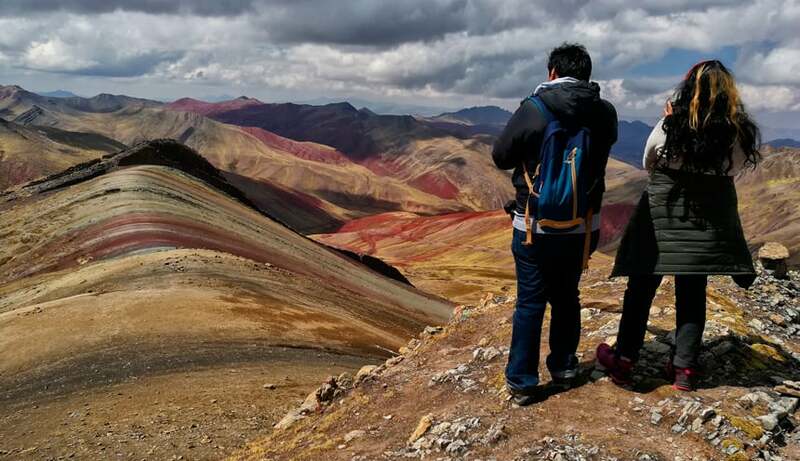 This hike is incredibly pleasing, full of traditional Andean wildlife and priceless canyon sights. However, there is a significant amount of uphill hiking. This, combined with high altitude, can be quite challenging. The reward is the experience of hiking alongside the canyon and seeing ruins, only few people can witness. Experience in trekking is recommended! After visiting the ruins of Waqrapukara we will continue the trek along the Apurimac Canyon for another 3 – 3,5 hour, finishing the hike in the village of Huayqui.